The terms ‘stress’ and ‘studying’ are practically interlinked in our cultural mindscapes. That children and youth will undergo travails as they move through school and college is accepted by both parents and educators. Even as we rant that children are under too much pressure, or that education is a crazy rat-race, our kids continue to be caught in a trying and demanding net of cultural expectations. Most of us know from experience that a certain amount of stress actually helps us perform better in tests and exams. While limited, short bursts of positive stress or eustress is conducive for learning, we have to ensure that children are not subjected to distress on a daily basis. By adopting various measures to address the multiple needs of students, schools and colleges may ensure that education is a positive, purposeful and pertinent experience for all. Today, many people who have studied in government schools are in good positions within and outside the country. The Department of Public Instructions has decided to bring them under a single umbrella of ‘alumni association’ to improve the conditions at government schools. It is an initiative taken by the Karnataka State Commission for Protection of Child Rights, which is being implemented through the district administrations. According to the information available from the commission, all government schools in the state should have ‘alumni associations’ by July 16. During my visit to government schools, I got to know that some of them have been developed by their old students. Hence the idea of old students association at government schools struck my mind,” she added.Private schools in the state are already having alumni associations, which help in their development in every possible way. “These associations hold annual events and support schools financially and morally. We are sure that alumni of respective government schools will also come forward to develop the schools in which they studied,” Alva said. The authorities of all 54,000 government schools will verify the admission registers of last 10 to 25 years. They will identify the residential address of the students and will send them invitations regarding setting up of old students association. In each letter, the contact number of the head master or the teacher in-charge of the school will be mentioned. Later, an official inauguration of the association will be done, where all students will be invited. BENGALURU: It's common for politicians to do nothing but crib about the dwindling number of students in government schools. But a politician-official partnership in Hubballi-Dharwad has managed to arrest this negative trend with a simple strategy: starting pre-primary (kindergarten) classes in government schools. The move has yielded positive results as the student intake in Dharwad Urban division has increased by 2,247 students in 61 government schools between 2015-16 and 2017-18. Inspired by the outcome, the government is contemplating starting kindergarten classes in all government schools across the state next year. The finance department is currently evaluating the proposal. 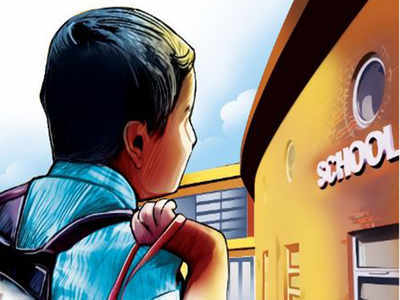 MLA, Hubbali-Dharwad (West), Arvind Chandrakant Bellad, whose brainchild it was to start kindergarten classes in government schools, said: "We realized that not many parents were putting their kids in government schools because the entry-level age for first standard is five years and ten months. So, parents preferred to send their kids, who have attained three years and ten months and out of playschool, to lower kindergarten (LKG) in private schools. The usual tendency among parents is to continue their kids in private schools and, hence, the number of kids in government schools was low. We decided to bridge the gap between playschool and first standard by commencing kindergarten classes in government schools." The move was not an easy one, given the legal hurdles and financial implications involved. Bellad started with the government school at Kelageri village near Dharwad by taking members of the school development and monitoring committee (SDMC) and local education department officials into confidence. "We decided to pool in resources and rope in teachers from outside for kindergarten classes. It worked and the number of admissions gradually shot up. The same model was replicated in 36 out of the 63 schools in 201415. It was extended to 40 schools in 2015-16 and 61 schools in 2017-18." The education department officials too joined hands by redeploying staff. "Some schools had teachers who had little work and some had physical training teachers with less work load. Such teachers were engaged in kindergarten. Of course, they were sensitized about the needs of kids and the larger goal of getting and retaining more students in government schools. We also got teachers from outside by paying them a monthly honorarium of Rs 3,000-4,000," said Bellad. What has made these kindergarten popular among parents is the fact that emphasis is being laid on teaching English along with Kannada.